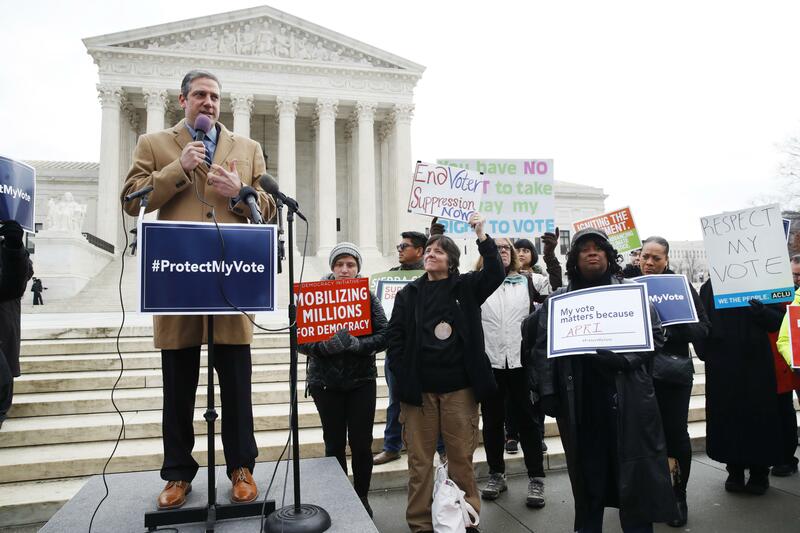 UPDATED: Wed., Jan. 10, 2018, 4:17 p.m.
WASHINGTON – The Supreme Court appeared sympathetic Wednesday to states that seek to prune their voting rolls by targeting people who haven’t voted in a while. In a case from Ohio, opponents of the practice called it a violation of a federal law that was intended to increase the ranks of registered voters. Justice Sonia Sotomayor said minorities and homeless people appear to be disproportionately kicked off the rolls. But the court’s conservatives and possibly also Justice Stephen Breyer indicated that they would uphold the state’s effort. Ohio is among a handful of states that use voters’ inactivity to trigger a process that could lead to their removal from voter rolls. A ruling for Ohio could prompt other states to adopt the practice, which generally pits Democrats against Republicans. Signaling support for Ohio’s defense of the process, Justice Anthony Kennedy said states are “trying to protect their voter rolls…What we’re talking about are the best tools to implement that reason, to implement that purpose.” Kennedy’s vote often is decisive in voting cases that otherwise split conservative and liberal justices. Breyer repeatedly pressed the lawyer for opponents of the process, but had no questions for the lawyer representing Ohio. The opponents say the 1993 National Voter Registration Act prohibits using voting inactivity to trigger purges and that Ohio purges registered voters who are still eligible to vote. A federal appeals court sided with the challengers. Ohio is backed by 17 other mostly Republican states and the Trump administration, which reversed the position taken by the Obama administration. Sotomayor questioned Solicitor General Noel Francisco at length about the switch. “Seems quite unusual that your office would change its position so dramatically,” Sotomayor said. A decision for Ohio would have widespread implications because it would fuel a broader effort to make it more difficult and costly to vote, Ohio’s opponents said. A dozen mainly Democratic states also want the Supreme Court to declare that Ohio’s system violates federal law. Paul Smith, representing civil rights groups at the Supreme Court, said most people who receive notices from the state never return them. “The evidence we have in the record is that most people throw it in the wastebasket,” Smith said. The state learns nothing about whether someone actually has moved if a notice is not returned, he said. He said a process that used a notice which could not be forwarded and would be returned as undeliverable if sent to a wrong address would satisfy the opponents. But Chief Justice John Roberts said he regarded Smith’s comment as a concession that states could use evidence of non-voting to trigger the process. “Your argument really turns on the adequacy of the notice,” Roberts said. Outside the court following the argument, Ohio Secretary of State Jon Husted, a Republican, defended the state’s election system. “We believe our state is one where we make it easy to vote and hard to cheat. We make every effort possible to try to reach out to voters to get them registered to vote,” Husted said. Published: Jan. 10, 2018, 10:43 a.m. Updated: Jan. 10, 2018, 4:17 p.m.